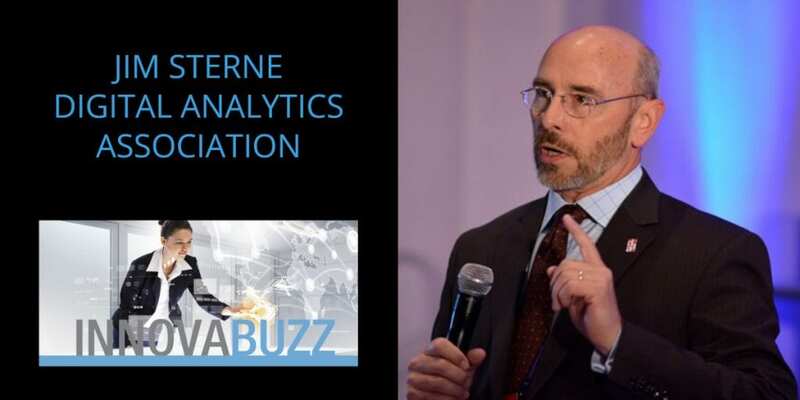 In this episode number 31 of the InnovaBuzz podcast, Jim Sterne of the Digital Analytics Association and founder of the eMetrics Summit shared with us his insights into all things data and analysis, in a way that was both very informative and highly entertaining. Jim is known as the “Godfather of Analytics” and you will learn why as you listen to this episode. Today’s competition prize has been generously donated by Jim who is providing a copy of his latest book “Devils Data Dictionary”, a less than serious look at Analytics, so stick around for details on how you can enter the draw to win that competition prize later on in the interview. Data without goals is pure narcissism! The Google Analytics generic dashboard is unlikely to be useful for most people. You should start with “What am I trying to accomplish?” and “How do I measure success?” The build your reports and dashboard accordingly. There is NO single number that identifies if you are doing a good job with your website, you need to track things that give you insights into what you are trying to accomplish. Curiosity is the most important trait any data analyst can have. The data leads to a bunch of questions and hypotheses, that can be tested. The three critical steps to start an analytics project are 1. Install the proper tags so that you are confident to have good data; 2. In the data, look for anomalies, which can give valuable insights; 3. Segment your site visitors into groups that represent different behaviours. It’s important as analysts to keep your eyes on the four business reasons, the four goals that an organization has. If you can relate whatever your nugget of insight is to those four, then people will listen. They are increased revenue, decreased cost, increased customer satisfaction, and increased capabilities. One of the biggest challenges of most websites, is that the number of visitors are relatively small (thousands) and the data may well be statistically insignificant. So we are trying to draw conclusions and insights from insufficient data. If there was a number one thing, you could do to differentiate yourself then we would all be the same! Here are Jim’s answers to the questions of our Innovation round. Watch the interview to get the full scoop. #1 thing to be more innovative – Bring together a diverse points of view. Don’t have a meeting of people who are made up entirely of people like you. Find people who have different experiences and different points of view and different ages to really mix it up. Best thing for new ideas – Take some serious time off of working and let your minds relax and big ideas can form out of that. Favourite tool for innovation – Caffeine! Keep project / client on track – Reminders with short deadlines, break things up into small bits. Differentiate – I think the best thing you can do is work as hard as possible to get into the mind of your customer. Because you are not the target audience. Your customer is. Try stuff. Throw the spaghetti at the wall and see what sticks. Be willing to take a risk. Jim suggested I interview futurist Thornton May on a future podcast. He is a very big picture, very far future and a seriously intelligent guy when it comes to innovation. So, Thornton keep an eye on your Inbox for an invitation from me, for the Innovabuzz Podcast, courtesy of Jim Sterne! Hi, I’m Jürgen Strauss from Innovabiz. Welcome to Episode No 31 of the InnovaBuzz Podcast – designed to help smart businesses with an interest in innovation and the Internet of Things become even more innovative. In this episode, my guest is Jim Sterne, the founder of eMetrics Summit and co-founder and President of the Digital Analytics Association. Jim brings over twenty years of sales and marketing experience to measuring the value of a Web site as a medium for creating and strengthening customer relationships. He is referred to by many as the godfather of digital analytics. He has written at least 10 books on Internet advertising, marketing, customer service, email marketing and web analytics. This is an exciting episode, with quite a bit of irreverence as well – Jim has a great sense of humour. We talked about the relevance of data, focusing on business goals and not getting bogged down in things that don’t matter. For today’s prize, Jim is providing a copy of his latest book “Devils Data Dictionary”, a less than serious look at Analytics. So stay tuned later in the interview, how you can enter the draw to win that prize. Now, let’s get into the Innovation Hive and get the Buzz from Jim Sterne. Jürgen: Hi, I am Jürgen Strauss from InnovaBuzz. I am really excited to have here with me today on this episode of InnovaBuzz Podcast, all the way from Santa Barbara in California, in the USA, the founder of the eMetrics Summit and President of the Digital Analytics Association, Jim Sterne. Welcome Jim. It’s a privilege to have you on the InnovaBuzz Podcast. Jim: Thank you for having me. It’s an honor to be asked. Jürgen: We didn’t actually meet but I heard you speak at the Loves Data Google Analytics Conference back in October I think it was or September it might have even been. I thought it would be cool to have you on the podcast. Here we are. Jim: Well, thank you. Yes, I remember distinctly that it was September because it was the year that I missed my birthday. I got on an airplane on September 6 and I arrived on September 8 and missed my birthday in between. Jürgen: That’s no good. I hope you caught up on the celebration then. Jim: Well, I guess I will have to start in Australia next year and then have two birthdays. Jürgen: Yeah, that’s right. That’s how you do it. Now, Jim, just for those people that don’t know, Jim brings over 20 years of sales and marketing experience to measuring the value of a website as a medium for creating and strengthening customer relationships which is a lot of what we deal with here at Innovabiz.. It’s really great to learn from his insights today. He’s referred to by many as the godfather of digital analytics. I think we will hear a little bit about that today. He’s written at least 10 books on internet advertising, marketing, customer service, email marketing, web analytics and a whole lot more. In fact just a quick competition announcement, Jim’s very kindly offered one of his … Well, his latest books The Devil’s Data Dictionary as the prize for today’s competition. Stay tuned later on in the podcast and find out how to enter the draw for that prize. Jim, before we start talking about data and websites and internet marketing and all kinds of geeky stuff like that, let’s find out a little bit more about you as a person and your journey to where you are today. What did you want to do when you were a kid and grow up, assuming you’ve grown up. Jim: Yeah, no, that’s not going to happen! Mostly what I wanted to do as a kid is figure out what I wanted to be. I had serious trouble with that in college because there was this amazing catalogue of classes I could take. Everything from urban architecture to sociology to mathematics, art appreciation and I couldn’t decide. I had to drop out for about a year and a half to discover why a college education is a really good idea regardless of your degree. What do I want to be … I knew I didn’t want to live off by myself and grow organic pumpkins. I knew that I did not want to be stuck in a large glass building with an infinite number of meetings all the time. I did take an aptitude test in high school where they asked a whole bunch of questions. When the counselor looked through my answers she said ‘well Jim, whatever you do, don’t be a farmer.’ That’s as much direction as I had as a kid. Jürgen: Yeah. Well, that kind of still left a lot of possibilities. How did you end up then in data and … Well, marketing I guess first and then data and analytics. Jim: I answered a Wanted ad in the newspaper that said No Experience Necessary and I qualified. I was selling Apple tools out of a retail store in Santa Barbara. I learned what a computer was and how it worked. I learned about business computers. I spent about five years selling business computers to companies that never had one before. Then went to work for a software company that made software development tools, or programs that help programmers write programs. This is me with an English literature degree in Shakespeare! My job was to understand what the engineers were talking about well enough so I could explain it to other engineers so that they might buy one. Sales that led to marketing. Then in 1993 I tripped over the internet and said ‘oh wait a minute, interesting. That will change things.’ I ran around trying to find somebody who could explain online marketing strategy, and came up empty. There was a webmaster at IBM and a webmaster at Sun Microsystems and a webmaster at Hewlett Packard. They asked me what I thought their strategy should be. I said I don’t know. They said ‘well, what did the other guy say?’ Well, suddenly I realized what it meant to be a consultant, who asks lots of impertinent questions and then rats everybody else out to each other and writes books. Jürgen: Well, you were obviously involved in the very early days of the internet and digital marketing. I can well imagine, I remember when I first came across the internet. I thought well, you could do a lot with this, but pretty much I found the same experience as you. That there weren’t many people out there that really knew what to do. It was kind of a completely uncharted territory, wasn’t it? Jim: Huge wait and see and it was pretty frustrating because I had a very clear idea of what it could be. It was so painful to make all of that stuff happen and sure enough even today surfing the web or trying to find information on your phone is aggravating. We’ve got a long way to go. Jürgen: Yeah. In terms of the Digital Marketing Association then, what … Can you give us a brief snapshot of what you do there and what the Digital Marketing Association does? Jim: Well, it’s the Digital Analytics Association. Jim: We are a bunch of people who discovered that a website had log files and log files made a record of every click that people made. We thought that might be useful for something. Well, that was a dozen years ago. Since then we have discovered ourselves being responsible for measuring not just how many people come to the website and how many pages do they look at, but did email drive that traffic? Did search drive that traffic? Did display drive that traffic? How do we measure social media and the impact that it has on marketing and sales? Can we connect up that information with customer service center, phone call information? How do we correlate that with advertising and television? Well, when web analytics came along, it was a completely different animal, because instead of looking at it from the top down, this was actual behavior. It wasn’t asking people their opinion. It was watching what they actually did. From there, trying to figure out what their intent was, trying to figure out what they were up to. Now, we live in a world where, the top down or the bottom up are coming together in this strange area called big data and you stir it all with a stick and you hope that something interesting comes out at the other end. Jürgen: Yeah, that’s a fascinating explanation and probably one of the simplest ones I’ve heard for a long time. I know a lot of people look at their analytics data. They are fascinated by the amount of information that you can get on a website. Then they often ask the next question, ‘oh what does 50% Bounce Rate mean?’ Or, ‘how come there’s more sessions when I have unique visitors’ and so on. That’s where the insights that come from, the marketing background has to come into it as well. Having the mix of both things is really important. Jim: Exactly. It’s really tough when you go to the effort of putting say Google Analytics tags on your website. Then you wait for a month or two for the data to be collected. Then you go and look at the dashboard and it’s very confusing at best. Because the first thing is well, here are the three things Google Analytics says I need to know. Clearly, Google is smart enough to know these are the most important things for me. It couldn’t be further from the truth. Those are just the … That’s just the generic dashboard covering everybody on the planet. It’s guaranteed not to be the most important things for you and your business. For that we’ve got to start with well, what are you trying to accomplish? How do you measure success? How do you know that the work you did today was worthwhile. That’s the question that touches on business model. It touches on investment strategy. It touches on the psychology of what you are trying to accomplish. It depends … It’s different for different industries. It’s even different by each campaign that you run. How do you measure success ends up being a political question that has to be answered before you could start looking at those reports. Jürgen: Yeah, and you said something in the presentation in Melbourne that I thought was lovely. It was something along the lines of data without goals is pure narcissism. Jim: It is like … Seeing how many friends you have on Facebook or how many likes you can get – that’s fun. It’s even entertaining. It is not useful. Jürgen: Yeah. I think coming back to the question of how do you measure success or what is it you are trying to accomplish which, like you say, can vary from campaign to campaign. If you have an advertising campaign, there’s a particular result that you are looking to achieve, and so matching the data up to that is really important. Going even more fundamentally to that in terms of how do you measure success that’s a really challenging question for a lot of businesses. Jim: It changes over time too. It’s fun. This has been the perennial question. Back in the day when I was an internet marketing strategy consultant, which means I did not actually have a job, I was asked ‘okay Jim, how do we make our website better?’ The response was, ‘well better at … What are trying to accomplish?’ That’s a three-day long conversation! Now, fast forward to the turn of the century, when I narrowed my focus from just customer experience down to how do we analyze it, how do we muck about with the numbers. The question was, ‘well Jim what should we measure?’ The answer is, ‘well, that depends, what are you trying to accomplish?’ There’s a three-day long conversation about that! Is there a single number that identifies whether you are doing a good job? No. If you are desperate for there to be a single number then the best you can do is net promoter score, which is: would you recommend us to other people? On a scale of 1 to 10, you’ve got your detractors who say ‘never’, and your advocates who say ‘always’. Then some distribution in between, if you just want one number that’s probably the best one to go with. It is wildly inefficient or insufficient to help you make any business decisions. Between that and trying to measure absolutely everything, it is some happy medium in between. Therein lies the challenge. Jürgen: I think one of the other things you said in the presentation was around taking some data related to a particular goal that you had. Then forming a hypothesis and not just looking at the data and saying, well, that’s X percent or whatever the number may be, but forming a hypothesis around what could that mean. Then testing that hypothesis with another measure on further data. Jim: Exactly. If I have 500,000 people visiting my website, is that good? Well, maybe. How about if we compare it against last month? Then we will tell if it’s getting better or worse. Here’s the hypothesis. 500,000 visitors which is better than last month. Last month I spent $1000 trying to promote my website. My hypothesis is that if I double my spend I will double my traffic. Let’s test it. That’s how analytics works. It’s, ‘well, I think maybe this is what’s going on. If that’s the case, then I can improve my outcome by doing this other thing. If I believe that then I will invest in a test.’ Rather than double my spend and suddenly I am out $2000, I am going to do a little test over the quarter to see if doubling the spend actually does double the traffic. Or maybe it only increases the traffic by 10% in which case it’s a horrible investment. Or maybe it triples my traffic. Then that leads to a bunch of other questions. That’s why they … If you are looking to hire an analyst, you are looking for the person who above all, the most important trait, is curiosity. They have another question and another question and another question. If you come across somebody like that hire them right away. Jürgen: Yeah. That’s a really good point. Like you say that’s where the value of analytics is. It’s not when you look at Google analytics for example which gives you I don’t even know how many pieces of data. It’s like I don’t think I’ve ever looked at everything. Jürgen: Yeah. Can you pinpoint a couple of pieces of data or maybe even just one piece of data to either validate or test the hypothesis that you’ve come with and then guide you in an action plan that hopefully you will get three times the number of visitors through a small investment? Jim: That’s the process. Step one is can I trust my data? Here’s the best example of how data is not trustworthy. There’s a wonderful thing called the Analysis Exchange that was created as a community benefit for free by the people at Analytics Team. In Analysis Exchange, a non-profit organization gets together with an advanced leading senior analyst and a newbie, a junior analyst, who … You can’t get any experience if you don’t have any experience. The new person is the mentee and the senior person is the mentor. The non-profit association says, ‘well, here’s my data, what can we do with it?’ This is all free for everybody. The first thing that always happens is, ‘well, we’ve looked at your data and it’s really … I am afraid the tags on your website are incomplete or incorrect or corrupted. The data that you’ve got is not very useful. The first project we are going to is retag your website, so that we can be confident that we’ve got good data. That’s always step one. It happens in every kind of organization all over the world because there is page tag rot. Over time people will put new pages on the website and forget to tag them. Or they will tag them in not quite the same way that all the other pages have been tagged. Step one, let’s get some good data going. Then, the next step is, well let’s review it and see if anything stands out. Is there anything obviously odd? Do we have some pages that are overwhelmingly popular and some that are never visited? What kind of hypothesis can we create about those? Well, on the one hand, it might be that people just don’t care about the subject matter for those pages. Or it might be, as my own website experienced one day, I forgot to put a link to those pages on any other page. We don’t have to … Surprise. I had to look at the documentation to find that out. Jim: Step one is, again, are there any anomalies? Anything goes bump in the night? Then the next step is to avoid averages. What’s the average number of people who visit my website in a day? What’s the average number of pages that they look at? What’s the average number of all of those things are actually useless, because it’s just telling you that you have more or less than yesterday. It doesn’t give you any insight. The most important thing to do next is segmentation. By that I mean can you figure out how to divide up the people who visit your website into groups that represent different behavior. That might be these people came from display and these people came from search. It might be these people come in the morning and these people come in the afternoon. It might be these people are more interested in this subject than that subject. All those don’t matter as long as you can identify different groups. Because as soon as you’ve got groups who exhibit different behavior, you can treat them differently. You can give them different content. You can respond to them in different ways. Even if it’s only gender or even if it’s only by the location of their IP address, anything you do to treat different groups of people differently, will increase the results you are looking for. That’s sort of the step one, step two, step three. Clean data, look for what’s weird and then start segmenting appropriately. Jürgen: Yeah. That’s been a very clear outline of how you should go about looking at your analytics and planning how to get value out of it. That’s great. Thanks for that. In terms of your own work, I know you do a lot of presentations, what do you … What do you spend most of your most on doing on a day to day basis? Jim: Well, my number one job is to find people to come and speak at my own conference, the eMetrics Summit. That’s been running since 2002. We do it in seven or eight cities around the world. The audience from the eMetrics Summit created the Digital Analytics Association. That takes a fair amount of my time too. The conference is my for profit side. The Digital Analytics Association is the non-profit volunteerism side. They both pull on me fairly equally. Jürgen: That’s an interesting model. The conference drove the demand for the Digital Analytics Association. That’s a non-profit thing. It’s a membership community right. Jim: Right. The audience from the eMetrics Summit said, ‘hey this is a great conference, but we really need more.’ The DAA, Digital Analytics Association is focused on professional development, so training, education, certification, helping people find resources so they can learn more, job board that sort of thing. And community, which means building local chapters, having people come together on the website for open forum discussion, interviews, activities, casual get-togethers and meetups. The thing we learned very early on and this is true of any nascent industry that’s just starting out. The people who did the work have a horrible time trying to explain what they do to everybody else in the organization. It’s very complicated. When they get together and they realize there is a room of like-minded people, who understand what they are talking about, and share the same problems that some of them have solutions to those problems, everybody gets very excited. Jim: I am trying to accomplish this particular thing with this particular web analytics tool or this particular customer relationship management product that I am struggling. Does anybody have any clues? Somebody in the corner says, ‘oh yeah, I solved that problem last week. Come over here and I will show you what I did.’ That kind of camaraderie has been the definition or it’s been the culture of the industry since the beginning when we were all struggling to make it work and struggling to explain ourselves to our colleagues. Well, now that we are in. We are all together at a conference or we are on the website having a conversation, we can use the shorthand. We know that everybody knows what we are talking about. It really helps move the whole industry forward because everybody is so interested in helping each other move the industry forward. We’ve gotten to the point now where one of our most popular subjects to talk about is storytelling, and PowerPoint presentations. Because as a group, generalization yes, but as a group, we are so interested in the data and we are so interested in the nuance and the minutia. That when we find something interesting, explaining it to say an advertising manager, or a product manager, or a sales team, turns out to be very difficult. Jürgen: Yeah, well, that’s a lot of fascinating stuff in what you are saying there. I mean, first of all the sense of community within an organization. Sort of the common interest of driving an industry forward. Seeing everyone succeed. Providing value rather than kind of the dog eat dog that you might see in other places. I know some of the communities I am involved with I see that contrast in some places. The ones that have that sense of ‘we want the industry to have a good reputation. We want to elevate everybody’s standards and make everybody successful. We will help one another to do that.’ They are really great communities. I had an experience the other day where we were trying to do some complicated code on a website. I didn’t know how to do that. I asked this one community and somebody said, ‘oh yeah I know how to do that. I simply will show you how to do that.’ There it was. Somebody solved a problem. Jim: Yeah. It’s kind of surprising and then suddenly you find yourself on the other side of that. Jim: Somebody comes up and says ‘I am so frustrated, I just can’t figure this out.’ ‘Oh I know how to do that. I can help you.’ It’s exciting that people help somebody. Jim: Then you realize oh that’s why. For example at the Analysis Exchange, senior analysts are willing to help young ones who have no experience because it’s so fulfilling. Jürgen: Yeah, it certainly is. I am in this community. I have contributed quite a bit there and so people were very willing to help me when I put out this question. The other thing that’s fascinating is the idea of presenting the information and the knowledge that you have in a way that actually resonates and is meaningful to your clients or to your audience, which … I find that very fascinating on so many different levels, not just on the analytics level. Because like you say, you can apply it to medicine or your car mechanic. Because I guess we are all so engrossed and focused on actually making something happen and on the nitty-gritty of what that involves that we sometimes forget. That when we are talking to our client, they are not interested in that part of it. They just want to know what does it mean for us. Jürgen: That’s what we are paying you for, right. Jim: That’s true. They don’t have the education. They don’t have the background. It’s not that they are stupid. It’s that they are simply ignorant. They don’t … They haven’t had the years of training. That’s not their fault. It’s just that the fact that they were focused on their job and not yours. When you go to them and start using your own jargon, you make them feel stupid. Nobody likes to be made to feel stupid. Nobody likes to have their time wasted. If you find a fascinating … If you work through the night and you find a fascinating nugget of insight you want to share how you found it. They don’t care. They really … You end up having conversations you should not have about. Well, how trustworthy is the data. Why does this number not match that number? It’s completely beside the point. We drill into our younger analysts to keep their eyes on the four business reasons, the four goals that an organization has. If you can relate whatever your nugget of insight is to those four, then the people will listen. They are increased revenue, decreased cost, increased customer satisfaction, and increased capabilities. If you come up with this amazing insight through your own blood, sweat and tears and you could show somebody how it will make more, spend less, make customers happy or make us more efficient, oh now they care. They will listen. If one of those people says, ‘I am curious about the data.’ ‘Ooh then let’s go have lunch and I will tell you all about it.’ I will have a convert. Jürgen: Yeah. That’s great advice. Focus on what is really important and make sure you know what the implications of the data are on those things. All right. In terms of all the activities then that you are doing, is there something that worries you and keeps you awake at night? Jim: Worries me. Yeah, I think I would have to say that I am worried that people are desperate for things to be black and white. The world is made up of nuance. I just want … Just give me the number. Just tell me what the number is and I will decide if it’s useful. That’s good in accounting. Bean counters and accountants and did we sell and how did we spend. That’s accounting. The stuff that digital analysts deal with is actually probability, likelihood, statistics. Did we have 500,000 people visiting our website? Well, yeah, more or less. Well what do you mean more or less? Can’t you tell me exactly? No. Well, why not? Wrong conversation! Because now we are in the world of technology that is fussy. While I cannot tell you exactly how many people visited, I can tell you that it was 7.32% higher than yesterday. Really? Roughly. Usefully. I want to know exactly. Sorry can’t tell you. We don’t live in that world. We live in a world where the technology gives us just enough data to be directional. We are getting more visitors. We are getting fewer negative comments on social media. I want to know how many exactly. Doesn’t matter. Even if I could give it to you, it wouldn’t make much of a difference. What keeps me awake is the general population. Non-analysts still think that we are counting people and clicks. In fact we are … The math is a little bit fuzzy math. Is it? Is it still useful? Oh it’s wildly useful! Having that conversation about: are they expect numbers or not is a waste of everybody’s time. Jürgen: That’s great advice. I will probably use that little short group of sentences quite often. I remember having a conversation yesterday. It was around Bounce Rate. I can’t remember the exact number but let’s say it was 45%. The question was, ‘well is that good or bad? What should I be aiming for?’ I said, ‘well, I don’t know. It basically is the same conversation, isn’t it? Jim: It is. It ends up with people focusing on the wrong things. If somebody says ‘all I care about is conversion, I want you to increase conversion on my website.’ I can do it, I can guarantee it by putting an end to all advertising at once. Then only people who already know who you are will come to your website. Only people who already expect advice from you will come to your website. Your conversion rate will skyrocket. Your company will go out of business. If Bounce Rate is the only thing that matters to you, then we can make sure that we put systems in place to keep away anybody who might bounce. Or we could change the definition of Bounce Rate. That would help change the number. Or we could … If the person says ‘all I care about is revenue. Just make more sales’. Easy. So $1 bill for $0.50. Your sales will go through the ceiling. Everybody will come to your website and buy. You will have zero bounce rate. Everybody will buy a $1 for $0.50. This is not a business model. Jürgen: Yeah. It comes back to those four business reasons that you mentioned earlier. Maybe you’ve answered this question, what do you see as the biggest challenges in the digital world. Let’s talk about the e-marketing or the eMetrics Summit and how you promote that. What do you see as the biggest challenges around that business? Jim: The biggest digital analytics problem that I have is that my numbers are statistically insignificant. I get several hundred people coming to my website each day. I start to try to shift my advertising and promotion budget around based on that smaller number. I am going to make some huge mistakes because it’s just not enough to be significant. In general things change. I like to refer to the tides. If I go to the beach and I see oh the water comes up to here. Then I run away. I make plans for building something in the sand. I come back and oh my goodness the water is all the way up to here. How did that happen? Now I go back and I change my plans. When I come back to the beach and the water is way down there. I need enough information. I have to watch the ocean for several months in order to understand that there are tides and that they change. They are trustworthy. I have to have enough data. Now, if you are running a test of what’s the right picture to put on your homepage to sell more stuff, and you are Amazon, then you probably get enough traffic in about 12 seconds to do a valid test. For me, a valid test would take several months. Over several months too many other things have changed. The closer you get to the conference, the more tickets are sold. That’s normal. I can kind of account for that. I don’t actually tear all of my hair out, and stay awake at night anymore. That’s for me personally. That’s the problem of being a small business … Is you just don’t have enough data. Now, can I see where my traffic is coming from and can I decide I am going to spend more money on LinkedIn than I am on Facebook? Yeah, that works for me. That’s over a large period of time. Now, you would ask what do I see as the biggest challenge in the industry and that’s a whole different animal. Because I am not the target audience. I am not a good example. Large companies who have enough data and enough vision to hire analysts or consultants, the biggest challenge for them is data integration. I have say, email data and search data and, and, and, and, and every new way to communicate that comes along. If there’s a new tool that will measure the activity. It measures it in its own unique way. It captures the data in a unique way. It stores it in a unique way. It cleans it in a unique way. It reports in a unique way. We have all of these individual tools that are measuring activity across these different channels. How I measure my mobile app is different than I measure my mobile facing website. It’s different than I measure my desktop facing website. It’s different from etc. etc. Now I’ve got to collect the data out of all of these silos and bring it together into … It depends on how old you are. You might call it the enterprise data warehouse. You might call it the hoodoo cluster or it might just be somewhere in the cloud. Well, that’s great. It’s altogether in one place. It doesn’t talk to each other. That’s the complexity. It’s the massaging the data so that it is correlatable. Examples include I want to take the data from all of these different collectors and look at it week after week after week. ‘Oh when does the week start?’ ‘Well, the NAT Tools starts on Monday, but the NAT Tools starts on Sunday.’ ‘Okay, we’ll just adjust for that and I will start on Monday.’ Okay. ‘Here’s the amount of traffic that comes to my website in the morning. Well, are you adjusting that for IP address so that it’s in the morning from the time zone you are looking at? Or is that the morning for you or is that like free time?’ This is just really light easy stuff. From then on it gets really complex. This is the biggest challenge. Now, it is possible if you do everything just right, it’s possible to identify that that is a single person. Then this is what their behavior looks like. It’s really tough to do. As we look at other data sources, data that can be bought from third parties. Data that comes from advertising networks. Data that is pre-processed by research companies. I do want to bring it all together. That is our current big challenge. Because the promise is huge. The promise is terrific that someday I am going to go to a website and it will know what I want and it will give it to me. I won’t have to click on a thing. I will be the happiest customer on the planet. We are a long way away from that. Jürgen: Yeah. Okay, well, this has been really fascinating Jim. There’s a lot of great insights there that will dissect and pull out and add to the show notes obviously. What I would like to do now is move on to our innovation round. That’s a series of five questions that hopefully you will give us some really short insightful answers that will help inspire the audience to do something awesome. Jim: I will keep it short. I am not so sure about the insights but we will see. Jürgen: What do you think … A lot of the things we talk about are innovation and what do you think is the number one thing anyone needs to do to be more innovative from your viewpoint? Jim: Bring together a diverse points of view. Don’t have a meeting of people who are made up entirely of people like you. Find people who have different experiences and different points of view and different ages to really mix it up. Jürgen: That’s excellent advice. I love that, yeah. What’s the biggest thing … What’s the best thing you’ve done to develop new ideas or new products in terms of say the eMetrics conference? Jim: Take some serious time off which people in the United States are terrible at. I think the Japanese are worse. Everybody else actually will take several weeks off of working and let their minds relax and big ideas can form out of that. Americans spend so much time just getting that next thing done and the next email answered that we don’t spend enough time taking a breath. Jürgen: Yeah, that’s great advice. I find that even doing that on a daily basis, taking time out to go and do something else whether it be exercise or photography in my case, that letting your mind relax so you come up with all sorts of ideas. Jürgen: All right. Do you have a favorite tool or system for improving productivity and allowing you to be more innovative? Jürgen: That’s great. It’s supposed to be good for you, the latest research shows too. Jim: Well, when you reach my age, you discover that everything is either the best thing for you or will kill you depending on how long you wait. It will come back again. Jürgen: All right. What’s the best thing to keep a project on track? Jim: Having a reminder with serious short, not short but small deadlines. This has to be done by the day after tomorrow. This has to be done by the end of the week. This has to be done by the end of the month. Instead of trying to chew on too much at once, break it up into small bits. Jürgen: Yeah. That’s great advice. Milestones and breaking it up into small bits. The piano teacher that my kids went to for a long time … She used to say when they were faced with learning this big piano concerto that went for 20 or 30 minutes … When they first started she said it’s not that bad. Just treat it like pizza, one piece at a time. Jürgen: All right. What do you think is the number one thing anyone can do to differentiate themselves? Jim: If there was a number one thing, you could do to differentiate yourself then we would all be the same. Jürgen: Yeah. I haven’t had an answer like that before. I guess a lot of people say different things there. Hopefully we can learn from all the different things that people tell us. Jim: If you want to press me for a real answer I think the best thing you can do is work as hard as possible to get into the mind of your customer. Because you are not the target audience. Your customer is. Jürgen: Yeah. That’s great advice. I am reading Captivology by Ben Parr at the moment. One of the things he talks about there is the framing trigger which very much is about capturing your audience or your customer’s attention by understanding their frame of view and what’s in their mind. All right. Well, thanks for getting us through the innovation round. What’s the future for you and the future for digital analytics? Jim: Well, there’s two parts to that. The future is bringing more people into the industry and getting them up and running as quickly as possible because this is one of those areas where there’s a huge need for people who are good at it. When times are good we can afford to invest in people, process and technology to improve capability and that’s terrific. When times are bad, then we desperately need somebody who can tell us if we are spending our money wisely. This industry always needs more humans to do the work. There’s lots of jobs going begging. On the shorter term, it’s let’s get more people involved, more people up and running. The longer term is some fun new technologies that are coming down the pipe that will help us do our jobs better. Help us master this big data thing. Will do predictive analytics. Then it starts getting into areas where there’s not really good definitions for what those things are right. Now, I am taking a good hard look at machine learning, where instead of telling the computer what to do, you tell the computer what solution you are looking for and point it at a dataset and you let it figure out how to get there. Fascinating. Jürgen: Yeah, that does sound fascinating. There’s a lot of research going back 20 or 30 years in the machine learning. I am not quite sure that we’ve actually … Well, we have made a lot of progress but I am not quite sure we are seeing the end result of that at any stage soon. Jim: We are seeing some really interesting things come up that are working. For instance Siri in your iPhone or I have an assistant called Amy. If you and I want to set an appointment to get together for lunch some day, I send you an email that says how does next week look for you. I copy Amy in the email. You and Amy have a conversation because Amy is an AI that is looking at my calendar and conversing with you through email. It is Artificial Intelligence, solving an extremely narrow problem that turns out to be very complex. Is Amy going to become sentient and become Skynet? No. We are starting to see tools like Facebook’s M and Microsoft’s Cortana that are pretty smart and pretty fascinating. Jürgen: Yeah, that’s an interesting one. I will have to look out for Amy. Jim: Sure you should … Let me make it easy for you. .ai is where you can find Amy. Jürgen: Okay, all right. I’ll look for her. Let’s get back to our competition. Again, as I said earlier today, the prize is a copy of Jim’s latest book, Devil’s Data Dictionary. Jim is very kindly donating that. I really appreciate that. Now this book takes a, what should we say, slightly different look at data and analytics and it’s a testament to Jim’s irreverent sense of humor if you like. We are probably seeing a little bit of that come through today. If you thought data and analysis was a dry topic then perhaps Devil’s Data Dictionary might just change your mind on that one. Jim, what do we want our audience to do to go in the draw for that prize? Jim: Well, that’s a great question. I am not sure what kind of competitions you usually hold. Shall we make them run up to the highest hill and see who can record the most elevation? Shall we make them donate the most of their favorite charity? Shall we make them email me and my email address is jsterne@targeting.com and tell me why you think it’s important that we make fun of big data? The best answer I will send you a book. Jürgen: That’s great. I like that. Why is it important to make fun of big data? If you email Jim and also if you leave a comment underneath the blog post then we can all share in your comments. Hopefully some of those will be insightful and humorous as well. I will touch base with Jim again in a few weeks’ time and get him to award that prize. Jim: Absolutely. I’ll be thrilled. In time for Christmas. Jürgen: Exactly yeah. This has been really fascinating. Jim, finally, what’s the number one piece of advice you would give to any business owner who wants to be a leader in their field, in innovation and in productivity? Jim: Try stuff. Throw the spaghetti at the wall and see what sticks. Be willing to take a risk. Jürgen: I love it. Yeah, great. You’ve given us your email address. Is that the best place for people to reach out and say thank you for what you’ve shared with us today? Jim: It’s the best. It’s very findable. I’ve had the same email address for 25 years and yes, I get a lot of spam. Jürgen: Okay. We’ll post links to that and also to the Digital Analytics Association website and to the … I see the Devil’s Data Dictionary does have a website of its own. We will post the link to that as well underneath the show notes, so that people can just click on the links. Finally, I always ask my guests who they would like to see me interview on a future InnovaBuzz Podcast and why. Jim: There is a gentleman at IBM. I am failing on … I am drilling, getting down and finding his name. It’s not going to be him. I can’t remember his name. That’s not going to work. Shoot. I’ve got one. There is a futurist named Thornton May. Thornton with an N, two Ns, one in the middle, one at the end. Last name MAY. He is a very big picture, very far future and a seriously intelligent guy when it comes to innovation. Jürgen: Sounds fascinating. Thornton May, look out for an email in your inbox or we’ll see if we can connect via LinkedIn and get you on the InnovaBuzz Podcast courtesy of Jim Sterne. Jim, thanks very much for sharing the time and your insights with us today on the InnovaBuzz Podcast. It’s been really fascinating. I’ve enjoyed this and learnt a lot as well. I will follow up with you in a couple of weeks’ time on the prize. Let’s keep in touch. We will send everybody to look at the Digital Analytics Association and the eMetrics websites, as well as the Devil’s Data Dictionary. Jim: Well, thank you so much Jürgen. It has been an honor as I said at the beginning, and a whole lot of fun. Thank you for the opportunity. That was certainly another fascinating interview and loads of fun too! I hope you enjoyed Jim’s contributions, as well as his quirky sense of humour as much as I did. And I hope you take away some useful information. All the show notes for this episode will be at innovabiz.com.au/jimsterne, that is J-I-M-S-T-E-R-N-E, all lowercase, all one word, innovabiz.com.au/jimsterne, for all of the links and everything we spoke about in this episode . Jim suggested I interview futurist Thornton May on a future podcast. So, Thornton keep an eye on your Inbox for an invitation from me, for the Innovabuzz Podcast, courtesy of Jim Sterne!